In the Press - Selen Mostyn. 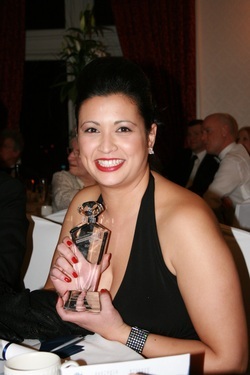 Published on 08/04/2011 13:28 GOOLE-based cleaning specialist More Time (UK) Ltd is celebrating after cleaning up in the Environmentally Responsible Business category at the inaugural Goole and Howdenshire Business Excellence awards. Organised by a committee made up of local business people, the first ever Goole and Howdenshire Business Excellence Awards ceremony took place at Cave Castle Hotel and Country Club, South Cave last month. More Time received the award in recognition of its commitment to minimising the impact of its activities on the environment by recycling and using environmentally-friendly products wherever possible, as well as training its team of employees to work in an environmentally-friendly way. A delighted managing director Selen Mostyn said: “The company is still relatively young – it’s not even three years old yet – but has grown very quickly to become a leader in its field in the Yorkshire region. She added: “I was especially pleased to win this category as we have always placed a great deal of emphasis on being environmentally-friendly, through the products we use and the way that we train our staff. The company was founded in June 2008 by Selen and offers a range of specialist cleaning services to clients across Yorkshire and beyond. As well as cleaning domestic and commercial properties, More Time (UK) cleans construction sites, crime scenes and provides deep cleans for kitchens. Team members are even trained to clean in areas affected by hazardous materials or substances. The Trendiest Tea Brand Setting For A New Stir In The Retail Market Supporting Dj's Worldwide A UK based firm is aiming to ‘stir up’ the tea market by launching an innovative range of black, green, herbal and fruit blends that are sure to appeal to tea drinkers looking for fresh, fun taste sensations. Jan. 12, 2012 - TeaJay was founded by award-winning successful businesswoman Selen Mostyn, CEO, who has let her imagination run riot and sourced the finest ingredients from around the world in order to create a truly unique range of loose leaf teas that will satisfy those who are bored of traditional teas. Tea lovers can now sample the end result of months of research, planning and preparation as the teas are on sale at www.teajay.com. TeaJay is in discussion with a number of retail outlets that have already expressed an interest in stocking the range after being impressed by the quality of the products and the company’s fun, fresh brand image. Inspired by Selen’s passion for quality tea, and her love of fun and quirky flavours, TeaJay has a blend to suit all palettes and match your every mood. There are ten different teas to choose from, including Penny Royal, a herbal mint tea that’s great for relieving congestion, which contains Indian Darjeeling black tea blended with peppermint, aniseed, ginger and cardamom; Corazon de Melon, a blend of milky Oolong green tea leaves (prized by the Chinese for their refreshing and energising properties), honey melon, guava pieces, barberries, tea flowers and sunflowers that works chilled and served over ice; and Day ‘n’ Night, a fresh, green Rooibos tea with a delicate lemony taste. Selen continued: “Our products come in loose leaf form because we believe that the age-old ritual of brewing your tea from leaves, rather than just sticking a tea bag in a cup, is an important part of enjoying a good cuppa. There’s something really soothing about it, and it means that customers can also see and smell all of the beautiful ingredients that make up their favourite blend. You only need one teaspoon of loose leaf tea per cup, so our tins of tea go a long way. TeaJay also sells a range of beautiful tea-making accessories, including a selection of luxury samovars and a kettle featuring SWAROVSKI® ELEMENTS, which make fun and glamorous gifts for the tea lovers in your life. There are also filters, iced tea jugs, tea glasses, measuring spoons, teapots and everything else you could possibly need to make the perfect cuppa. Prices for the refillable tins of tea featured on the website range from £9.60 to £14.50 plus some introduction offers. As much as we love a traditional cuppa, there's something invigorating about tasting a new tea flavour and Yorkshire brand TeaJay has come up with the goods with a range of black, green, herbal and fruit blends. Yum! Day ‘n’ Night, a fresh, green Rooibos tea with a delicate lemony taste. © TeaJayAward-winning businesswoman Selen Mostyn has really let her imagination run riot and sourced the finest ingredients from around the world. We couldn't agree more... indulging in a good cup of tea even before it reaches your lips is all part of the pleasure. Our favourite for now has to be the spicy Indian Summer tea. Pefect with a dash of milk after lunch or dinner, it helps transport us away from the dreariness of a British winter. The website has a full list of teas and a range of lovely tea-making accessories including filters, iced tea jugs, tea glasses, measuring spoons and teapots. Mrs TeaJay put the kettle on. AN EAST Yorkshire entrepreneur is causing a stir in the tea market with the launch of an innovative new company. TeaJay is the result of months of planning and research by award-winning businesswoman Selen Mostyn, backed up by years of experience working within the tea industry. The company in Goole offers a unique range of black, green, herbal and fruit blends, and is designed to offer exciting taste sensations to existing tea connoisseurs, as well as attracting new tea drinkers. All of the teas take their fun and funky names from songs and pieces of music, including techno track Club Bizarre by German-based DJ Brooklyn Bounce and Wind Of Change by New York-based singer/songwriter Lew Doty. Mrs Mostyn said: "I got absolutely bored by the selection of teas in the marketplace. "There are a lot of specialised teas, but there is nothing that combines quality with a bit of fun, so I hope the new range will attract a younger audience. "We all listen to music, so I am linking flavours to songs." Mrs Mostyn said the aim is to inject some much-needed colour into the tea market. She said: "Tea drinking should be fun. "We want it to be like music with the right mix for the right situation. "We want to stir it up and open up exciting teas to anybody who wants to enjoy our greatest passion in new and exciting ways." Mrs Mostyn has been involved with the tea industry for years and some of her inspiration comes from her time in a tea shop in Germany when she was 17 years old . "The shop sold hundreds of flavours," she said. "I have always loved tea but I have always had to buy it from abroad." Despite only being launched this week, TeaJay is already in discussion with a number of retail outlets that have expressed an interest in stocking the range. Mrs Mostyn, who last year clinched the environmental friendliness accolade at the Goole and Howdenshire Business Excellence awards for More Time Cleaning Services, said: "We are looking to sell the tea in farm shops, local stores, cafés, bars and hotels." Published on 01/10/2010 12:48 TRINITY Methodist Church will be looking spick and span when it celebrates its 110th anniversary next month. Goole-based cleaning specialists More Time (UK Ltd) offered their services free of charge to the Clifton Gardens-based church to mark the special occastion. A team from More Time will visit the church on Clifton Gardens the week before the anniversary celebrations begin to clean it from top to bottom. The company’s managing director, Selen Mostyn, explained: “We cleaned the church last year and everyone was so appreciative; we received some lovely letters of thanks. “With the anniversary celebrations and Christmas approaching, we thought it would be nice to offer to do it again free of charge. Barbara Scowcroft, senior steward at Trinity Methodist Church, said: “We were so pleased with the work that More Time did for us previously. “We wanted to get the church cleaned with such a significant anniversary approaching and Selen kindly offered to do it for free, which is greatly appreciated. Trinity Methodist Church’s 110th anniversary falls on Sunday October 24 and there will be a celebratory service at 10.30am, led by the Reverend John Fisher.